Reading progress update: I've read 1 out of 341 pages. Tie-in books are not normally a thing I do. Ever. 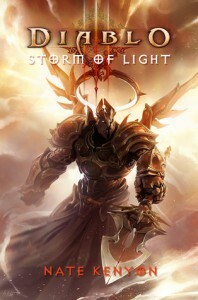 But Kenyon also did Diablo 3: The Order back before the game first came out, and it was decent for a tie-in. As well, the books he's been writing for Diablo 3 appear to be relevant to events on the game, and since the first expansion, Reaper of Souls, is due out in March, well, here I am. Hopefully it'll be as passable as The Order was.